great story for another day, an exciting moment or two, but what a mess. Fondue can be fun, intimate and playful. It shouldn't be a dangerous game of food roulette. 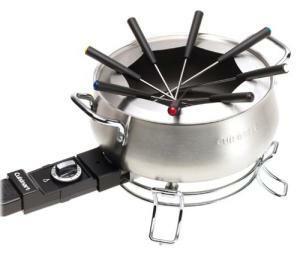 The Cuisinart Fondue Pot is electric, so it works without fire and eliminates the need to search strange corners of the local hardware to find Sterno. This model comes with a stainless steel fork ring. If you haven't had fondue before, you may not appreciate how helpful this accessory will be. This keeps the individual forks in front of each guest and keeps them from sliding all around the pot when not in use. The interior is nonstick, so the cheese, chocolate, broth, or oil will come right out. For those of us less familiar with fondue cooking, the user guide has an assortment of above-average recipes for dipping sauces and luscious desserts to accompany a wide variety of fondue mains. Fondue can be a great way to practice portion control, but still feel like you're getting both a treat and a full meal. It slows the progress of dinner down, leaving more room for conversation and interaction.